This entry was posted on 5/26/2016 03:30:00 AM and is filed under GUN CONTROL , GUNS , VERMONT . You can follow any responses to this entry through the RSS 2.0 feed. You can leave a response, or trackback from your own site. Sadly, we do have to walk among you. Well, it is a fact that all crimes involving guns are committed by gun owners. This is how gunz 'n ammo industries lie to RWD to convince him that liberals are: a) stupid, and b) out to get his guns. Buy moar gunz ammosexuals! Gunz 'n ammo industry CEOs laugh their asses off at how teh stupit it burnz the rightwing dittoheaded lemmings are... all the way to their huge off-shore accounts. 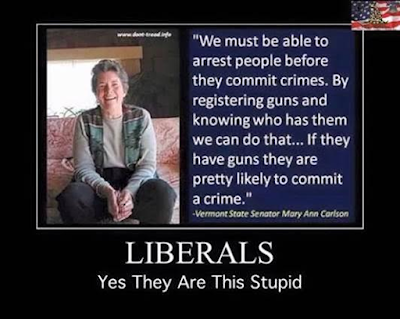 Conservatives: Yes, they are this stupid. The only way to justify the very stupid idea that background checks before all gun purchases are just not necessary is to portray opponents of that very idiotic idea as being even more stupid with crap like this. Its like they are saying "If you think I'm stupid- look at her!" Trump is the ideal candidate for this demographic- children in adult bodies.